They Came, They Played, They Conquered -The Popple Ridge Pickers | "Northern Crossings"
They came with a tremendous amount of wires, cables, speakers, and microphones. They had two keyboards mandolins, banjos, violins, guitars. They had a control board, and the monitor. They packed all the stuff in a trailer and drove 60 miles with the weather people claiming that things could get dicey in the evening with rain and sleet predicted. And still they came. 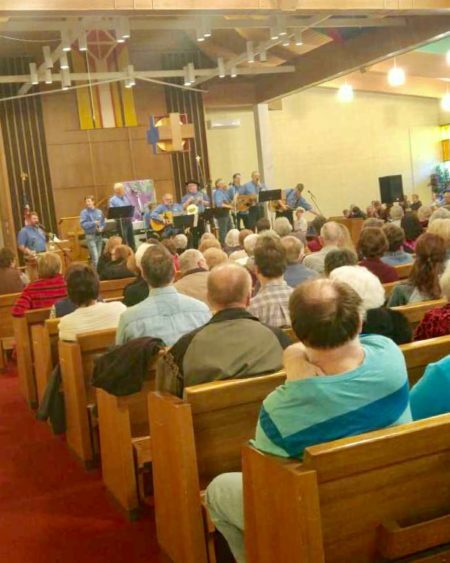 They came to the All Faith’s Chapel at the Life Skills and Transition Center to put on a free concert in support of Project 24, the project chosen for support by the worshipers at the Sunday morning church service at the Chapel. They were rewarded with some coffee, and some bars, and the joy of being able to sing some wonderful music and have some wonderful people listen to it. not take attendance but the chapel was pretty much full. The place was close to full at 3:30 when the pickers did a sound check and received a rousing round of applause. I have never seen applause for a sound check before. The music was wonderful. They propped me up on a stool and gave me the privilege of playing with them. Then they loaded up their trailer in the midst of a pouring rain and lightening storm and went home. Thanks to the Pickers and those who came to hear and all the helpers and workers who worked so hard. It was a grand evening.